Imagine walking into a room without any color. How would that make you feel?” asked Ann Marie Fiore of Cocoon in Sheridan Park in Bluffton. She frowns, pauses and then brightens up with, “Now imagine a room with color—blues, reds, greens, purples, yellows, oranges? How does that make you feel—better, right?” I nod. She’s spot on. Colors create dimension. Colors generate energy. Colors spawn creativity. Fiore radiates a spectrum of good energy. Her navy and poppy colored dress complements her caramel blonde hair and tan skin. Her big smile is made bigger with her bright brown eyes and coral colored lipstick. She is passionate about design and has been for over 20 years. She first cultivated her aesthetic working in the fashion industry and now infuses her expertise in home décor. Plus, Fiore has lived all over the East Coast, which has enabled her to be well-versed in coastal palettes like the bright hues of Key West and the west marine tones of the Northeast. She imbues these combinations into her own home and encourages people to explore how specific colors can personalize their living space. “From total saturation to subtle accents, we hope to help you feel comfortable adding color into your home,” Fiore said. Colors also interact with each other. By the entrance to Cocoon, a display features a plush bed with a navy and aqua comforter and a mixture of crisp white and fun, patterned pillows. The bed is complemented by an area rug with the same blue hues but adds a soft but spunky lime green color making anyone lust for a Sunday morning laze-a-thon. A wall with light brown dowels draped with Fiore’s complete line of Lowcountry Linen hand towels is the very definition of refined simplicity. The stark white towels provide the perfect backdrop to illuminate colorful Lowcountry icons such as the Palmetto tree and beach elements such as crabs or seashells. In the back, a vignette with an airy, geometric John Robshaw fabric with muted colors looks like a Real Simple or House Beautiful cover and entices you to finally finish decorating that guest room. In fact, every nook and cranny of Cocoon inspires you to make your house homier. The name “cocoon” comes from a cute childhood story about Fiore and her father. For her, the word signifies everything a home should embody—comfort, warmth, a nurturing environment. 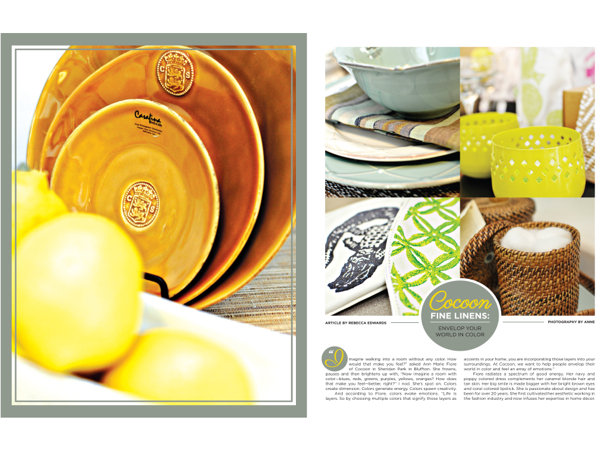 Since opening last winter, Cocoon has established a well-deserved reputation for carrying high quality, attractive and vibrant home accessories. Fiore describes one of her guest rooms painting a pretty picture of a room we all would love to stay in. “The ceiling is aqua blue “so when my guests lie down, they are reminded of the ocean and they feel tranquil. “Of course, so much of what Cocoon has allows people to enjoy their own home more, too,” Fiore explained. Cocoon offers an array of fine linens, bedding, tabletop items, placemats, totes, bath scents, candles, rugs, and lamps—just to name a few. 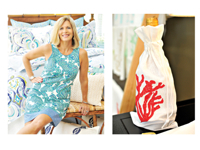 Fiore makes an effort to showcase local, Lowcountry talent. Looking around the showroom, you will be pleasantly struck with how refreshing and clean the store feels. Neutrals like white, off-white and taupe serve as a canvas for pops of color. Today, Fiore is burning a Savannah Square candle—the fragrance is called Square Troup (all candles pay homage to the historic city’s squares) and it delivers a summery, fresh aroma of pineapple and cilantro. As your senses take in everything, you can’t help but feel like hosting a luncheon or curling up with a good book in a sun-filled room. And you can’t help but want to embrace your own design aesthetic—and therefore envelop your world in the colors that resonate with you, whether it be blues, reds, greens, purples, yellows or oranges. For more information, call (843) 815-3315, e-mail cocoon@hargray.com, or visit on Facebook at cocoonfinelinens. Cocoon is located at 17 Sherington Drive, Suite A, near the DMV in Bluffton.